This photograph is of the American Humane Education Society (AHES) display at the State Sunday-School Convention held in Atlanta, Georgia in 1925. On the table you can see the piles of books and pamphlets that were distributed through this booth. 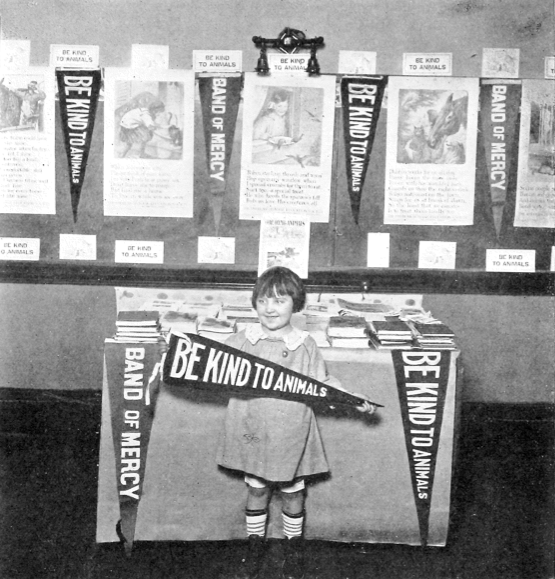 The text adorning the banners and pennants decorating the booth alternates between “Band of Mercy” and “Be Kind to Animals.” The posters on the wall are from a series of posters the AHES began selling in conjunction with the New York-based National Child Welfare Association in 1921.